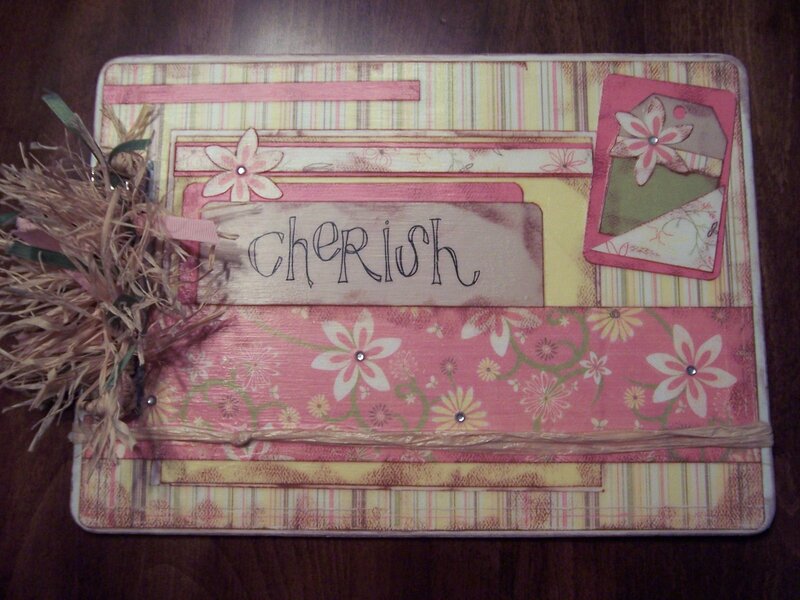 Just thought I would finally post the clipboard I made for Lindies room. I actually made 3 in total. I am not sure what I will do with the other two but I just thought that they were so cute. TFL. I don't know how to make my mom believe me that I need her to give me all her stamp sets cause I fall in love with every one I touch. 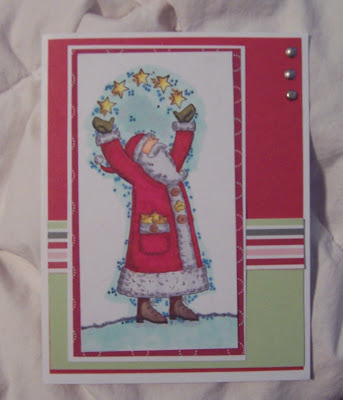 This is a stamp set by Stampin Up and it is called Star Santa. I colored it with my copic markers. 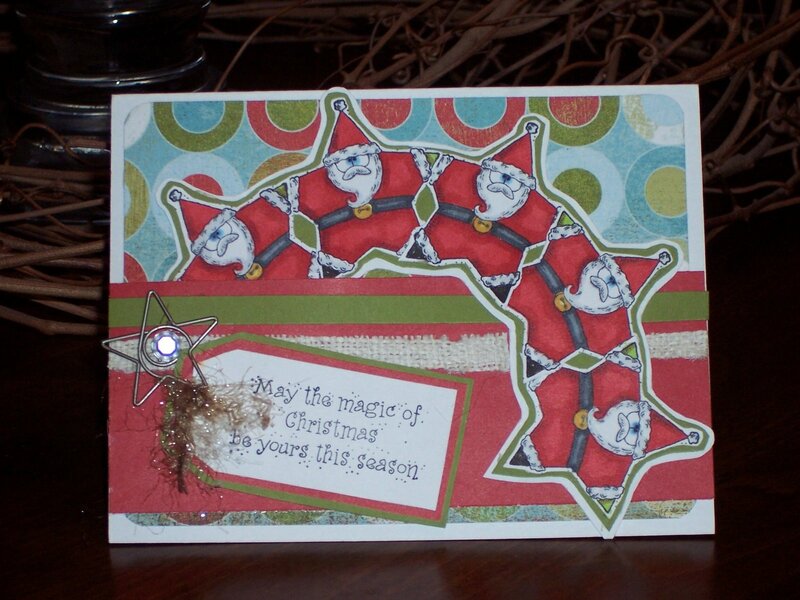 I also used basic grey paper, SU old Olive and real red. *Remade it without the bag. It just didn't look right. Mom said it looked like a weird embellishment and had to ask if it was a bag. It looks good in real life! 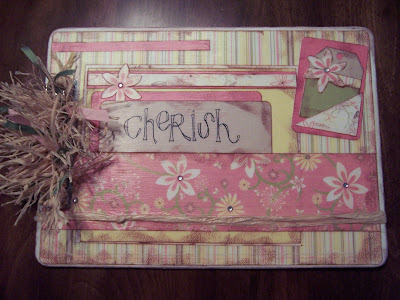 I just ordered Magnolia stamps...I just ordered Magnolia stamps... I think.... There was no place to put a credit card number so I am not sure. I have been drooling over these for some time now and my stampin up lady canceled stampin up this month so I thought I would buy something new with my monthly budget!!! I am so stinkin excited. Stamps make the world go round!!! So potty training at our house has been a joke. My DD is 3 and then some and still doesn't quite get it. We got back from getting doughnuts this morning and she was still dry!!! I asked her if she needed to go and she put her hands on her hips caulked her head to one side and said "I don't have time for this" LOL Kids say the funniest things. I have attempted to do this many times and it never turns out very good. But I think this turned out wonderful. I love my new copics. I will give this to Karl for someone at work that needs some cheering up!! I made this card today just because I wanted to play with my copic markers again I love the flock for the frosting and the markers color so vibrant. I had a hard time with the layout so I hope you like it. Ahhh up all night, and then up early in the morning, I guess that is the life of a mom... I had to cancel my stampin' day with my friend and violin. I thought I would show you my new monstrosity stamp I got on Saturday though. It makes me happy! 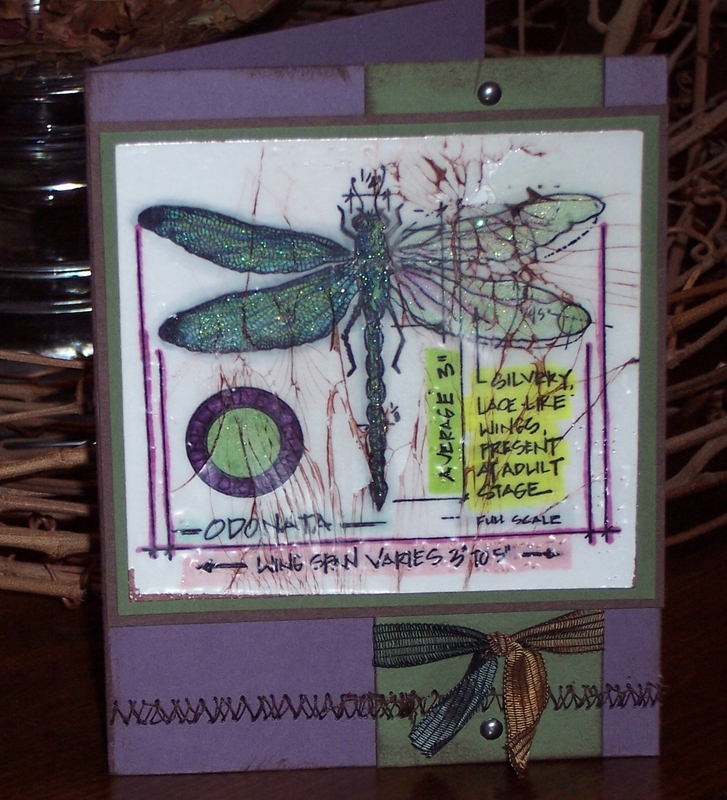 I bought it thinking that I would like the other four stamps I bought better, but I have not put this one down. I think he is so cute. Again these are the watercolor crayons from stampin' up. I have been debating whether to buy copic markers or not.... Ahhh they are so expensive but I would love to play with them. My mom came over this week and so I decided to borrow her water color crayons I never thought I would be able to make them look good at all but I think this card looks great. I really like the watercolor crayons. Maybe these will make it so I don't NEED the copics right now.